Long before the Toyota powered Elise and Exige, Lotus combined a Japanese power-plant with exotic car styling to make a funky, front-wheel-drive, convertible. 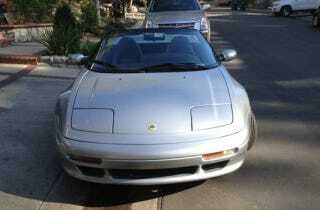 So if all your friends have NA Miatas and you are looking for a "real" British roadster, check out this Lotus Elan for $12,750. The original Elan that came out in 1962 followed the formula of the quintessential British roadster: compact, light, and rear-wheel-drive. But for the M100 generation Elan, Lotus took a different route. They used GM resources combined with Isuzu and later Toyota engine and transmissions to make what was arguably the best handling front-wheel-drive convertible ever. This particular example seems to have survived pretty well over the past 20 years. The next generation of Elan will be coming out shortly and this model will surely be a classic. My daughter drove the car to school and I drive the car to work 2 days a week. (approx. 75 miles a week). The car runs great, personally I have never had any problems with the car- its fast, gets 25 mpg city and around 40 mpg on trips, but most of all you have a very unique car- I don't ever see any on the road. For those of you who know the car; both headlamp motors are new and both the electric mirrors work. Interior is in great shape, the body is good but not perfect- some paint dings. The top is original. I have replaced the rear window, but you can expect to replace the top in the next few years, along with the original rubber window moldings. I have had the transmission recently rebuilt and the clutch, shifter cable and clutch and throwout bering replaced. Tires are at about 1/2 their life. Radio has been upgraded, brakes were upgraded, Turbo works fine. The car has 109,000 miles. I will let you talk to my mechanic or we can make arrangements to go to yours. I don't know when the "next generation" Elan is due to hit showrooms; my guess is about the same time the RX-7 will go on sale. While some may see this Lotus as nothing more than just a fancy Civic Del-Sol, real Jalops will appreciate this wonderful marriage as they are carving the corners down the California coast.